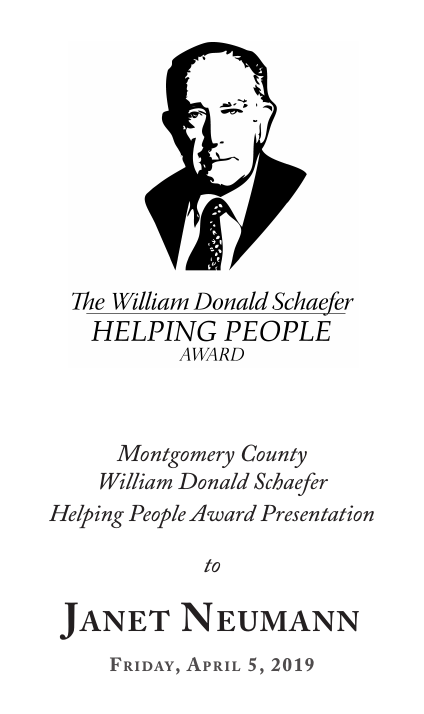 We are so proud of our own volunteer extraordinaire, Janet Neumann, who was honored by Maryland Comptroller Peter Franchot with the William Donald Schaefer Helping People award for Montgomery County on Friday, April 5th. 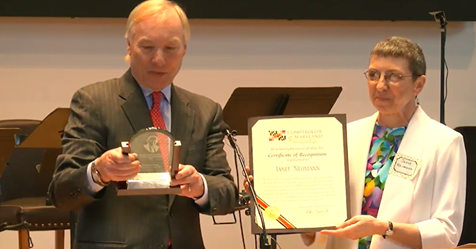 Congratulations on this well-deserved recognition, Janet! And THANK YOU for the incredible, above-and-beyond work that you do, in service to our community, each and every day! Approximately 70 people and four media outlets attended a beautiful reception planned and prepared by Margo Goldman with the help of other Executive Committee members that was held after the award presentation. The four media outlets in attendance include Montgomery County Media, Local DVM, Fox 5 News, and Montgomery Sentinel.